– could be the greatest ‘superfoods’, according to research done by scientists from Louisiana State University. The cereal is low in sugar but packed with healthy fibre and plant compounds that combat heart disease and cancer. Scientists found boosted levels of water-soluble anthocyanin antioxidants. Anthocyanins provide the dark colours of many fruits and vegetables, such as blueberries and red peppers. They are what makes black rice ‘black’. 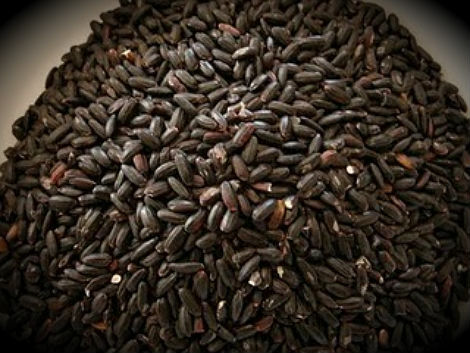 Centuries ago black rice was known as ‘Forbidden Rice’ in ancient China because only nobles were allowed to eat it. But food manufacturers could potentially use black rice bran or bran extracts to make breakfast cereals, beverages, cakes, biscuits and other foods healthier. Varieties of rice that are black or purple in colour are healthier still. Black rice could also be used to provide healthier, natural colourants. Studies linked some artificial colourants to cancer and behavioural problems in children. In reality, it’s unlikely there’s a single food out there that will have a great impact on lowering your risk of heart disease. Healthy eating is about a balanced diet overall. It’s great if you can eat more of some groups of healthy foods, like having five portions of fruit and veg a day, but there is still no conclusive evidence that ‘super foods’ alone make a real difference to your heart health.